Indulge in classic elegance with an alluring pair of shimmering cultured freshwater pearl drop earrings. Set in chic 9ct white gold for a fresh feel. 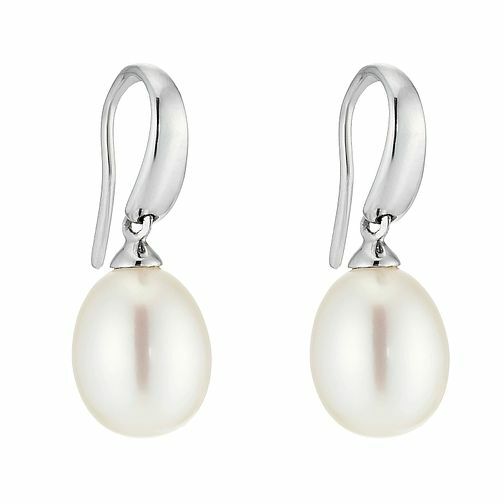 Keep it stylish and simple with a pair of pearl earrings. 9ct White Gold Cultured Freshwater Pearl Hook Drop Earrings is rated 3.0 out of 5 by 2. Rated 1 out of 5 by Anonymous from poor quality These earrings looks very nice but the earring hook is very soft and bends very easily when handled. unfortunately their return policy on earrings is once seal of packaging is broken you cant return item. How can you check quality if you cant open the product?